MYRTLE BEACH, SC - The Atlanta Braves announced several player transactions today with six affecting the Carolina Mudcats active roster. 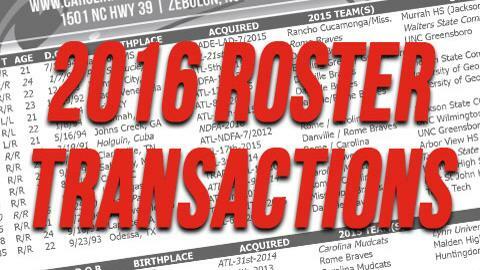 The transactions included the transfer of C Joseph Odom and INF Joey Meneses from the Carolina Mudcats to the Mississippi Braves, the transfer of LHP Ryan Lawlor to the Mudcats from the Danville Braves and the assignment of free agents INF Jose Fernandez and C Isaias Tejada to the Mudcats. Lawlor, additionally, was placed on the Carolina disabled list. The Carolina Mudcats roster is currently at 25 active players with eight on the disabled list.